The Cinematheque is located at 4070 Vilas Hall, immediately South and East of the intersection of Park Street and University Avenue. Room 4070, also known as the Parliamentary Room, is in the center of the open fourth-floor plaza of Vilas Hall and is accessible from the Park Street stairs and elevator, and the stairs on University Avenue and the stairs facing University Square and the Lucky Building. If approaching the building from Park Street, take steps or ramp to the 3rd-floor main entrance and then either the outdoor staircase or the indoor elevator to the fourth floor (this last is the recommended route for wheelchairs). If approaching from the East, take the staircases next to the Hemsley/Mitchell Theaters or the stairs on University Avenue to the fourth floor. Parking is available in several locations. There are two parking structures on Lake Street: one at State and Lake and one at Johnson and Lake. Public parking is also available in the Fluno Center™ underground lot on Frances Street at University, and under Grainger Hall, entering on Brooks Street at University. The Cinematheque is on bus routes 2, 3, 4, 5, 6, 7, 8, 9, 11, 12, 13, 14, 15, 19, 27, 28, 29, 38, 80, 82. 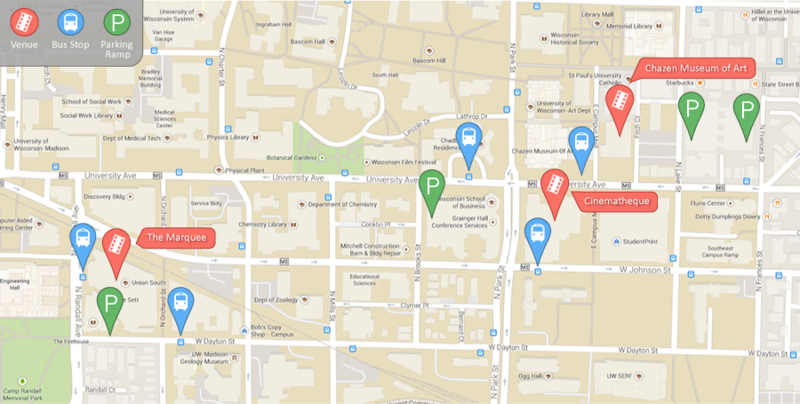 Please visit Madison Metro Transit to find the best bus route.